For certain kinds of scientific exploration of the deep sea and lunar environments, mobility of the research platform is essential. Historically, remote landers deployed to planetary bodies and to the bottom of the world’s oceans have been fixed in a particular location and have not been capable of movement. Progressively, the trend in both deep sea and planetary research has been to develop mobile systems capable of investigating environmental change over a range of spatial scales. The latest generation of Mars rovers, the Jacobs University Bremen Deep Sea Crawler and the various Autonomous Underwater Vehicles (AUV’s) operated by many marine research institutes are examples of this. 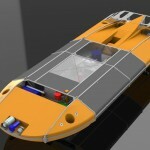 Within the ROBEX community new techniques to aid mobility in the deep sea and in lunar environments are being developed. New techniques in mapping around vehicles automatically from image data alone are in development and several new vehicle designs are being investigated to best access extreme environments. 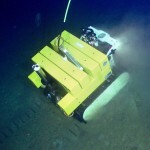 The deep Sea Hybrid Rover (H-ROV, Fig 1) is under development by Marum and other ROBEX partners, and will be capable of exploring the under ice environment semi-autonomously using thrusters, and the Jacobs University Bremen Deep Sea Crawler is capable of exploring the seabed using caterpillar tracks (Fig. 2). The applicability of these two systems for autonomous operations in the sea is being investigated. 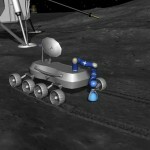 For the moon, the ROBEX pilot Active Seismic network (ASN, Fig. 3) Moon scenario requires travelling distances in the 10 km range over more or less moderate surface area which makes a wheeled rover the favourite vehicle of choice. Power storage, data transfer and communication with a base Lander, and autonomous navigation have been regarded as key design options. Geometric and structural sizing, the right choice of suspension and locomotion concepts (suspension kinematics, motorization, wheels) are of primary interest and under further study. This investigation goes hand in hand with the robotic arm design (WP 3300) attached to the rover and the development of seismic instruments to be carried by the rover and manipulated by the arm. Besides the more traditional wheeled mobile systems, which surely have their advantages in moderately shaped terrains while transporting several instruments to be deployed and retrieved to and from ground, non-wheeled systems for very uneven and rocky terrains like legged crawlers are also within the scope of ROBEX. The existing DLR legged crawler will be studied further for potential use in Moon exploration scenarios. To extend the capabilities of future six-legged exploration robots towards robust rapid locomotion, DLR has simulated and analysed several simplified models (planar and 3D) that employ passive compliant elements within the legs. One of the goals within ROBEX is to find mechanical structures that show intrinsic self-stabilizing properties and thus help to reduce the complexity of control.